The title character in Dostoevsky’s 1869 novel The Idiot is Lyov Nikolayevitch Myshkin, or “Prince Myshkin,” as he is generally known. He is fair-haired, about twenty-eight, frail and unwell, an epileptic given to seizures at unexpected moments. For the last few years he has been living as a charity patient in a sanatorium in Switzerland. When the novel begins, he is released from the sanatorium, although he is not well, and is returning by train to his native Russia. He comes into some money (less than he at first thought) that allows him to live without working. In Petersburg, he falls in with a collection of characters and finds himself so completely out of his depth because he is so unlike any of them. He seems to the others naïve and unworldly, trusting and good (in a world where there isn’t much that’s good). He earns the appellation “idiot,” not for lack of intelligence but for his simplicity. Prince Myshkin befriends a family known as the Epanchins. The matriarch of the family, Lizaveta Prokofyevna Epanchin, is a distant relative of his and is in fact “Princess Myshkin.” The Epanchins have three daughters in their twenties. Prince Myshkin seems drawn to the youngest daughter, Aglaia. Whether she is drawn to him in return is not immediately clear, not even to her. The Epanchins waver in their belief that Prince Myshkin is an acceptable son-in-law. If they start to have a favorable opinion of him, something always happens to make them change their minds. His potential marriage to Aglaia is an on-again, off-again proposition. Also in love with Natasya Filippovna are Gavril Ardalionovitch Ivolgin (known as “Ganya”) and Parfyon Semyonovitch Rogozhin (on the train with Prince Myshkin when the novel begins and with him also at the end, playing an important role in how the story is resolved). Gavril Ardalionovitch Ivolgin is the older son of the Ivolgins. His father, General Ardalion Alexandrovitch Ivolgin, is one of the most colorful characters in the book. He tells improbable stories about historical events in which he played a part in his younger days (one a long, involved story about being a “page” for Napoleon when Napoleon’s armies invaded Russia). The introduction of The Idiot states that it’s a “digressive” novel, meaning there’s a lot that happens that doesn’t have anything to do with the plot. It’s a long book (559 dense pages) that could have been shorter if it hadn’t seen so “digressive.” That’s the way with Russian novels, though. Forget tight plotting and economy of words. In one of the digressions, the character Ippolit Terentyev, who is dying of consumption, writes a long, long “explanation” of his life, which he then reads to a roomful of people, for no apparent reason. That’s not to say it’s not interesting, but it just doesn’t seem to serve any purpose. There’s a character list at the beginning of the book that helps to keep the characters straight, especially since the same character will be referred to by one name in one place and then referred to by another name in a different place. For example, the person we have come to know as “Prince Myshkin” is called “Lyov Nikolayevitch” a little farther along. I found myself referring to the character list a lot. For the dedicated reader of “heavy” reading (not “light,” not “breezy”), or for the fan of Russian novels, The Idiot is a fascinating reading experience. I was really glad to get to the last page. The next book I read will be something fun and easy. 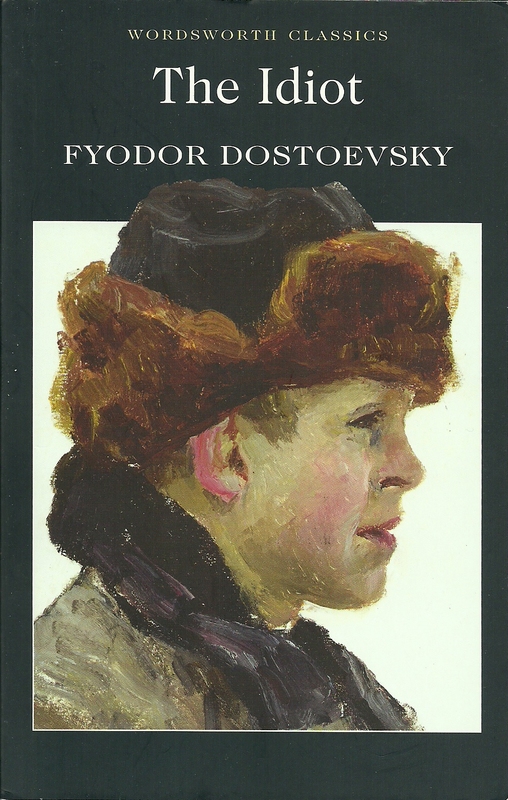 Posted in Uncategorized and tagged Allen Kopp, capsule book review, Dostoevsky, The Idiot. Bookmark the permalink.